This can make you eligible to receive a tax credit of between $2,400 and $9,600 depending on the qualifying category. 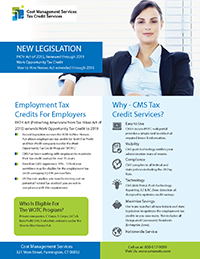 Employers can create tax credit savings by using the Work Opportunity Tax Credit when they are hiring. Depending on how many people you hire, the tax credit savings can be quite significant. Between 8-15% of New Hires may fall into one of the qualifying categories for WOTC. If you hire 100 people annually, and 8 – 15% of those new hires qualify, you may be able to obtain a tax credit of between $19,200 – $36,000. 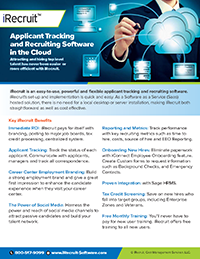 iRecruit and iConnect is a system that can practically pay for itself through the addition of these valuable tax credits. You can link your iRecruit and WOTC accounts easily. You can use iRecrut’s email templates to request that new hires complete the WOTC Survey online, via multi-lingual call center, or by paper. iConnect customers can include WOTC as part of all of their new hire documents. iRecruit customers who would like to use WOTC can request the addition of WOTC through your account representative. This entry was posted in Blog, iRecruit Blog, WOTC Tax Credits and tagged What Is the Work Opportunity Tax Credit (WOTC) and How Does It Benefit Employers?. Bookmark the permalink.